My word for this year is LEARN. So it just makes sense to use this Year of Sundays to reflect on 52 of my most significant Life Lessons. Some may seem more significant than others, but each one has changed how I live my life in powerful way. I’d love to hear if and how any of these same lessons have surfaced in the classroom of Your Life. Being ‘cracked’ is the best thing that ever happened to me. My primary crack is multiple sclerosis (MS). On March 12, 1991 (8,175 days ago), I received the diagnosis. I was gobsmacked. Then I was terrified. Then I was mad. Then I was sad. Then I was hope-impaired. Then I was hopeful. Now I’m good. Don’t get me wrong, MS isn’t a cake walk. No brokenness is. Most days, I need to sleep at least 14 hours. My cognition is slowwwwwwwer than I’d prefer. Summer heat zaps me. My peripheral vision is shot. There are many days I can’t walk. There are also many days MS never even enters my mind. Stuff in my body will happen and I’ll just go with the flow. Oh well, Plan B.
I’m not a superwoman. I tried that for a while and hung-up my cape years ago. These days, I make plans and am ready to change them. That’s just one of the gifts MS has given me. It’s helped me be more flexible. proven to me that I.am.not.in.control – whew. What has your crackedness taught you? 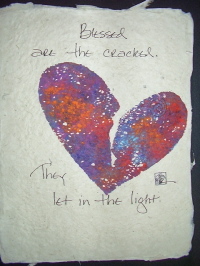 ps – I’d be honored to send a FREE Cheap Therapy hand painted handmade paper “Blessed are the cracked. They let in the light” poster to all who reply here. Just post your reply – then (if you want the free poster) ,’private message’ me your name and address. We cracked folk gotta stick together 🙂 This offer ends August 04, 2013. Posters will be mailed by August 24, 2013. Next postwhen did THAT happen? My “crackedness” has taught me to accept who I am! Oh I so needed to read/hear this message right now! It is a perfect follow-up to the book I just finished…Broken Open by Elizabeth Lesser. Both readings remind me of a sermon I heard about years ago. In the sermon on All Saints Day, the priest walked around the church talking about the stained glass windows of saints. To sum up his talk, he shared that saints are really people who let THE light shine through them. Like everyone else, I have been cracked open by so many different life experiences. And each one has added to who I am today. I have to admit, some experiences cracked me more than others (my accident and divorce top the list) but those experiences are also the ones that have opened me most to the wonders of God’s grace and the world/people around me. And right now, as my world has cracked me a bit more, I am thankful for the reminder you provided me…….while the cracks may hurt, they are all for good too. And even though they are for good, I don’t have to like the cracks, but I can enjoy the light they provide. Very thoughtFULL insight into what makes You so beautiful…. I love you! Cracks teach me patience, acceptance, mindfulness, and let me (occasionally) let loose with some very satisfying not-so-nice words. I wouldn’t wish rheumatoid arthritis on anyone ever, but I sure wouldn’t be me without all these years living with this disease. Grateful for some cracks and still fighting with others . . . but always learning from them whether I like it or not. So good to see and worship with you this morning! – I too have been cracked by many life experiences – then tried so hard to “fix” them ~ but there goes the light ~ and (obviously) they’re not really fixed! ~ so, I continue to learn to accept/deal with/appreciate them. ThankFUL for God’s grace and mercy each day that helps me deal with my colorful cracks! 🙂 Thank you so much for your wonderful insights that come through your writings. You are a blessing to sooo many! Thanks Lisa for having the right timing and reminding me that my cracks don’t mean I’m completely broken! Hard to imagine living on this earth for almost 70 years without developing many cracks….some large, some small, most well deserved. Some of them manifest themselves as wrinkles. My biggest issue is being able to forgive myself for my mistakes and mis-speaks. Still working on that. Forgiving others is much easier than forgiving myself. Your sunshiny attitude helps me see hope and possibility for tomorrow. Thanks for sharing yourself with us. Hi Lisa, in reading your comments, what comes to mind is how a stained glass artisan purposely cracks, snaps, and puts small pieces of colored glass back together. The many different colors, sizes, and patterns of the glass and the hard work involved, make for truly a work of art. If the “cracks” were not filled with “solder” the glass would not be complete. When we have “cracks” in our lives we try to move on, make the best of the situation and maybe learn a lesson or two. Our “solder” can be any number of things. Prayer and giving it to the Lord works for me. Its hard work to fill in the cracks, but a necessity. I try not to dwell on it and move on as quickly as possible and “LEARN”. My currently most noticeable crack is a broken heart. Losing my daughter at 26 broke it, and I know the love that heart contained for this beautiful girl just flowed when it broke. What I am learning is that the flow is continually replenished. Love was never actually contained, it just overflowed. I have great pain, because I have great love! My brokenness has fostered humility. It has shown me that when the cracks are mended, that place is stronger than it was before. It has strengthened my faith that God has chosen me, allowed me to be broken & then blessed that brokenness as a means of offering help, hope, and comfort to others. And, that ultimately, He will heal and make me completely whole, without crack, spot or blemish. Years ago I read an author who said, “You can’t have a wave without a trough. You can’t appreciate light without dark.” Without down times, we can’t appreciate good times. And Lisa, you’ve taught me that down times don’t have to mean BAD times. And the bad times make us so mindful of the good times. You always see the good in anything happening in your life. And that’s been such a good and valuable life lesson for me. You see the dark, but always know there’s light just waiting somewhere. And you always find it. And I’m always thankful for that….and you. Tom, you are always my Light. Pam- Love the idea that in a stained glass window it is the cracks that hold the entire thing together. It has me thinking……so really, our cracks are the “glue” that keeps us together. Interesting thought……..Kind of like something I heard Iyana say on Oprah radio…….scars indicate sites of pain in the past…..but over time, the scar is a sign of past hurt and pain, but all it is is a mark on our bodies after awhile….that reminds of us past pain, but reminds us of how strong we are. OK, one more God moment: Everyone go read August 2’s devotion from Forward Day by Day (it’s online if you don’t have a little paperback). Now I have shivers up and down my back. I do have much foolishness and God has much Grace!